After all quantities are entered, press the 'Add to Cart' button. 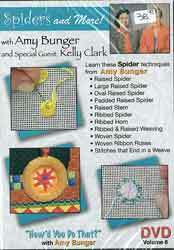 Description: Learn these Spider techniques with Amy Bunger ~ Raised Spider, Large Raised Spider, Oval Raised Spider, Padded Raised Spider, Raised Stem, Ribbed Spider, Ribbed Horn, Ribbed & Raised Weaving, Woven Spider, Woven Ribbon Roses, Stitches that End in a Weave. With Special Guest Kelly Clark. 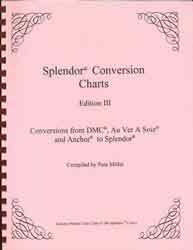 Description: Conversions from DMC, Anchor, and Soie d'Alger to Splendor Silk. This chart is updated periodically as new Splendor colors are added. As of this printing, the latest edition is #8. Includes printed color card of 310 Spelndor colors arranged by color families.